We heard today the sad news that world-renowned fashion designer (and bibliophile) Karl Lagerfeld has died. It reminded me that back in 2011, I desperately wanted to profile the German-born Lagerfeld in our magazine, having been enticed by images of his 300,000-volume library like the one below, taken by Piotr Stoklosa. So I got in touch with a journalist friend, a bilingual American who had lived in Berlin for a while, which I thought might help in communicating with Lagerfeld’s assistants or handlers. Getting to him, however, turned out to be impossible. Images of his library are widely shared online, and they turn up year after year; it’s clear people really want to know more about this incredible collection, and how and why he filled his life with books. I suppose now it will be dismantled, sold at auction or through a bookseller--perhaps even his own bookshop, Librairie 7L, in Paris--which may be when it finally gets its close-up. In 2015, he said, “If you go to my house, I’ll have you walk around the books.” Indeed. A few more photos of Lagerfeld’s library -- yes, with books stacked sideways!-- can be viewed at My Modern Met. We heard today the sad news that world-renowned fashion designer (and bibliophile) Karl Lagerfeld has died. It reminded me that back in 2011, I desperately wanted to profile the German-born Lagerfeld in our magazine, having been enticed by images of his 300,000-volume library like the one below, taken by Piotr Stoklosa. So I got in touch with a journalist friend, a bilingual American who had lived in Berlin for a while, which I thought might help in communicating with Lagerfeld's assistants or handlers. Getting to him, however, turned out to be impossible. Images of his library are widely shared online, and they turn up year after year; it's clear people really want to know more about this incredible collection, and how and why he filled his life with books. I suppose now it will be dismantled, sold at auction or through a bookseller--perhaps even his own bookshop, Librairie 7L, in Paris--which may be when it finally gets its close-up. In 2015, he said, "If you go to my house, I'll have you walk around the books." Indeed. 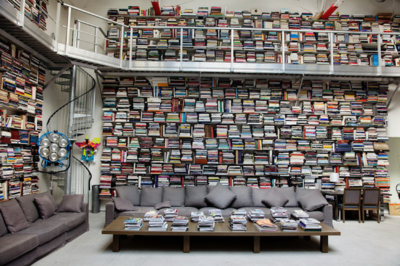 A few more photos of Lagerfeld's library -- yes, with books stacked sideways!-- can be viewed at My Modern Met.